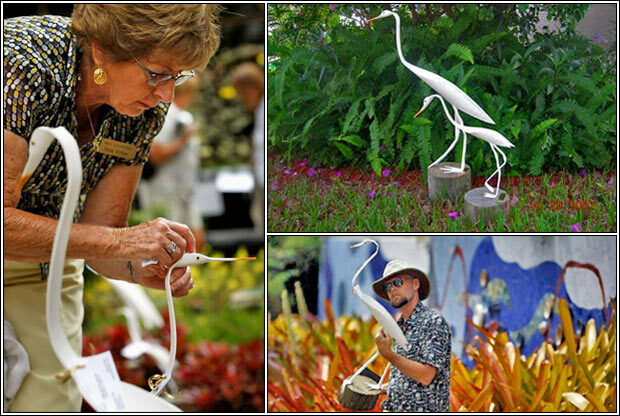 CHARLES & NINA KIRKER - began sculpting their Florida Birds when they retired and came to Naples in 1991. They have increased their flock from a one-legged egret to many different sizes and species of Florida Shore Birds. Their birds can be seen in the landscaping of many homes around Naples. Their native Floridian birds have long been a favorite souvenir to take back North. "just want to say thank you! Your birds are amazing! I had purchased a bird several years ago. I was so glad to find you now have a web site where I could purchase a piece of Naples for my Northern home"
"How nice to find a souvenir made in Naples & meet the artists who created them. Thank You!" "Our bird flew home on the plane with us yesterday. He now presides over our garden."